...Unless you have a beer holder nearby! The idea of protecting my decks from sloppy beer drinking became known to me one night of amateur-hour scratching years ago. I got a little too vicious on the ones and twos and my slipmats got drenched with Leinenkugel's. The solution was a simple one; build a beer holder to assure my bottle was placed in a fool-proof, tip-proof slot! 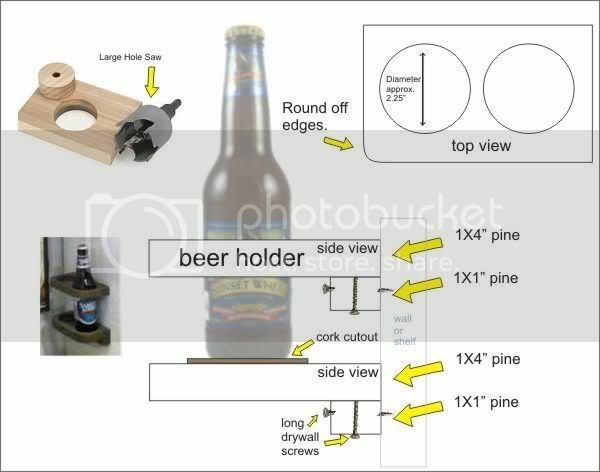 I had the scrap wood and tools, so I went to work with these beer holder plans. 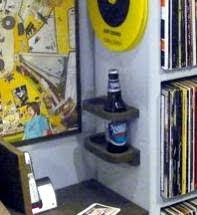 This is very easy to make, so I'm sharing em with my fellow sloppy DJs as requested by 'anonymous' below, here are the plans so now you too can build your own beer holder for your studio! Note: These plans are specific for a standard 12 oz bottle of beer. To: Anonymous, you can modify these plans by getting a bigger hole saw that fit a 40 oz. they do make hole saws that big, they are just harder to find. ng, and maybe paint, screw it in the wall or shelf near your decks and it's done!